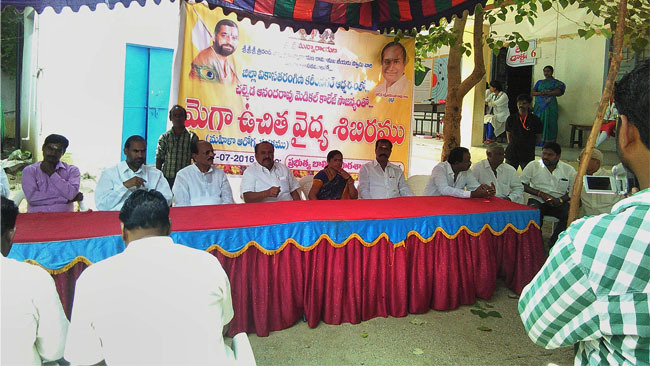 Free women health camp was conducted by Vikasatarangini at Sri Venkateswara Swami Temple in Suryapeta. Overall 116 women have availed this service, of which 106 women have received V.I.A tests. 36 women have gone through further tests. Despite the lab report was taking more time than usual, Dr. Saradha Ramana waited patiently to complete all the activities in the camp to make sure all the patients have received good service and received correct information. Mr. M.Satyanarayana and Mr. M Srinivas have promised to support Arogya Vikas in every way to conduct such health camps. They have also inspected the health camp and encouraged the volunteers. Suryapeta Arogya Vikas representative Smt. Manjula and her team had conducted survey in the area and spend 3 days of their valuable time to get all the activities completed thoroughly. Among those women who had V.I.A tests there were more women from Christian and Muslim community. This highlights Suryapeta Arogya Vikas efforts in spreading the service with no barriers across to all the societies.